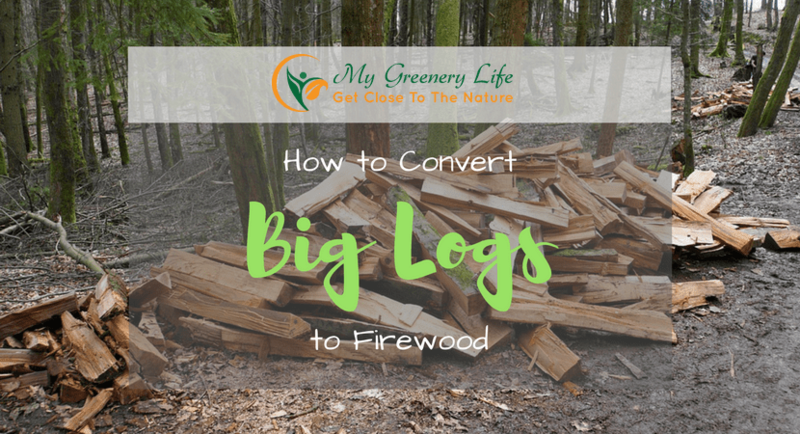 Do you want to cut big logs to firewood? Yes, precut firewood exists. However, it's fun to cut firewood. It feels manly and it's also good exercise for you. Enjoy a sense of pride when you chop down your own wood to make fire with them. Just remember that cutting the raw logs themselves require a lot of effort and special equipment before you can end up with wood that merely requires splitting. Before summoning the inner lumberjack with you, you should remember that aside from precut firewood, you also have the option of using heavy wood splitters and large felling axes to make quick work out of multiple logs. However, they're not multipurpose. A nice sturdy hatchet is usually enough to get the job done. A hatchet, wood, and brute strength is all you need when push comes to shove. A chainsaw is called for when prepping a log. When cutting firewood, jeans and a wife beater usually don't cut it despite what Hollywood might suggest. You should wear proper clothing that includes a long-sleeved shirt, pants instead of shorts, work gloves, safety goggles, and work boots. Get a face shield and hearing protection when using a chain saw as well. Know the size of the log you're dealing with before swinging away with that hatchet. The different techniques will vary depending on the size of the log or the number of logs (a log splitter typically splits multiple logs of a certain size at the same time). A hatchet is enough to deal with smaller logs and bigger ones require different tactics to be dealt with properly. Before anything else, don't forget to sharpen your chainsaw with a chainsaw sharpener! Afterwards, run down your chainsaw over the raw log in order to cut off all its branches. Use a 16-inch chainsaw to ensure a good job. You can clear the log further with your own pruning shears or gardening to get rid of any branches that your chainsaw neglected to cut in the first few runs. This is called "limbing" the log. From there, you want to cut the log into 16-inch-long pieces, which is the ideal log length for many fireplaces. Don't cut the log all the way through. Instead, use your chainsaw to make a shallow groove for every 16-inch increment to serve as a guide mark where you'll be cutting the log. Space the grooves in a uniform fashion by using a 16-inch long bar or a tape measure. Lay the bar flat against the log after butting the saw's motor housing against the log's end. Remember where the bar's tip meets the log then lift the saw to cut the groove on the mark. Set the chainsaw's motor housing on the groove again, put the bar flat on the log again and then repeat until you complete the grooves. Soon, you should have 16-inch grooves on the entire chopped-up tree. Afterwards, utilize your chain saw to cut about ¾ of the way through the wood at every 16-inch mark. Don't try to cut all the way through again. Just cut a few inches short to avoid sawing through rocks and dirt and damage your chain. Roll the log 180° and cut through the final one-quarter of log. A maul is the best tool for firewood splitting. The wood-splitting maul looks like a cross between a sledgehammer and an axe. They come in many sizes, from 6-8-pound maul or a 12-pound sledge axe. The smaller the maul the faster you'll swing it and the more times you can swing it without becoming exhausted. 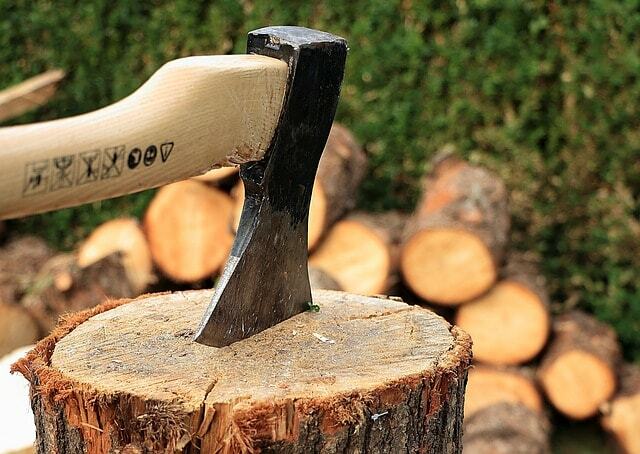 Here's what you need to do to split wood with a maul or axe. Get a chopping block or a tree stump to help you split the log into pieces. As mentioned earlier, you can also split multiple firewood pieces by wood splitters. Or you can use a hatchet to split them one by one. The logs should be 14-16 inches and at least 12 inches in diameter. Set your chopping block on even ground and then stand the log on top of it. Stand with your feet apart by the width of your shoulders. For right-handers, grab the end of the axe or maul handle with the left hand near your hip then use your right hand to grab the top of the handle with your right hand. If you're a southpaw, reverse the hands. Raise the tool over your head, then as you swing with a downward stroke slide the right hand down to your left hand. Drive the axe or maul down the log's center. Don't swing the tool in an arc a la a pendulum. Instead, you should make it come down through the wood in a straight line. Firewood, as the old saying goes, warms you two times. Once when it's cut and once more when it's burned. If you want to burn calories and save money, then invest in cutting and splitting wood on your own. It allows you to work up a sweat and end up with a rewarding activity. You don't need to cut them perfect, but this activity is a worthwhile skill that you can perfect over time.